John Lewis has announced a range of shopping technologies it will be trialling over the Christmas period. The retailer will be trialling transactional tablets in its Cheadle, Brent Cross and Peter Jones stores. These tablets will allow staff to process payments for customers, allowing them to skip the queues. The tablets will be linked to the shop’s Epos till system, and will be able to print a receipt from a mobile printer for customers at the point of sale. 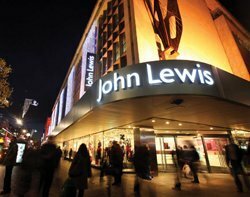 John Lewis said it is the first retailer in the UK to have this functionality integrated with its Epos system. “We intend to keep investing and innovating in our shops so that they remain compelling and hassle-free places for customers, offering multiple reasons to visit them," said Simon Russell, director of retail operations development at John Lewis. "Partly, this will see us use an increasing amount of technology to make shopping easier and offer more in-shop help,” he added. The retailer has also announced that its Oxford Street store in London is the first department store in the world to be mapped out fully by Google Street View, allowing customers to navigate the store and virtually browse the aisles. If successful, the virtual tour, which was designed by Ideal Insight, could be rolled out to other branches in the next two years. And finally, the retailer has implemented mobile phone charging stations in its Peter Jones and Watford stores. The ChargeBoxes, which are in the final development stage of a trial with the retailer, provide customers with 30 minutes of power for mobiles, tablets and other devices for free. Customers can choose the correct cable to charge their device and lock it away inside a unit while they shop. If successful, ChargeBox will be installed in other John Lewis stores next summer. But yesterday, IT problems hit the John Lewis Partnership, which also operates Waitrose supermarkets. Around 400 Waitrose customers were affected by an IT glitch which forced the supermarket to cancel its online deliveries. The 'technical problem' prevented orders from being gathered for some online deliveries. The supermarket now says orders are being processes as normal. While John Lewis is continuing to improve its in-store shopping experience for customers, research from Kalixa Group has found that 58% of 66-88-year-olds now shop online, which is only one percentage point less than the national average. In addition, 34.5% of these silver surfers are confident in the security of shopping online, which is 5.5 percentage points higher than the national average of 29%.